When I was little I was completely into Barbies. I played with them all the time. 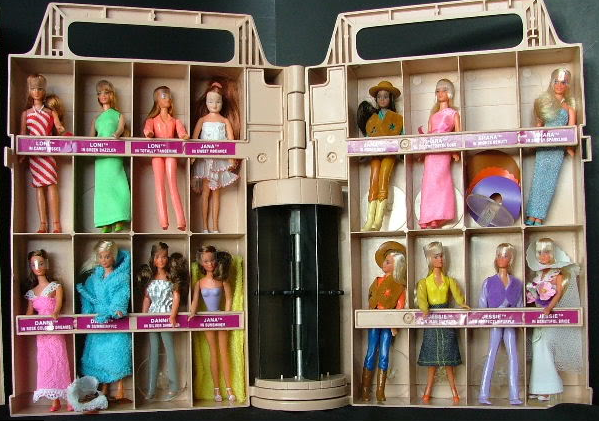 I had a huge box filled with clothes for them... and I had a Barbie Dream House (complete with groovy 70s furniture). I played with them all the time. And, having a brother... my Barbies tending to be really good friends with HeMan and all of his pals. I also had a doll house I played with a lot. And Glamour Gals. And Strawberry Shortcakes. And I spend hours of time with Light Brite. I PLAYED with TOYS. It was pretty easy to shop for me. Just buy me a new Barbie accessory. It's hard to tell people what to get Zoe and Ana for birthdays and Christmas... because they don't spend hours playing with favorite toys. They have never asked for a Barbie... and don't have a single one (although I still have some new in their boxes that I always thought they would play with). They have some little dolls. They have a billion Littlest Pets. They like to collect any toy that has bunches of characters/pieces to be collected. (I'm SURE Ana would die to have the box of Glamour Gals... but she wouldn't actually PLAY with them. They like craft kits and drawing (there are a million drawings and papers all over my house at any given moment). They both love books. They are both techy kids (and I encourage it). (I swear the iPad taught Ana to read before she turned 4.) I never say no to a book or learning app. But... how fun is it to tell people to buy them an iTunes or book store gift card? So... I'm always excited when they start to write their Christmas lists. I'm interested to see how many things are actually things I think they'll play with or use... and how many things they add on just to have a list. This year... I thought I would share their lists (so far). Disney Infinity Characters, Minecraft stuffy, Christmas Beanie Boo, PS3 Batman 3: Beyond Gotham, PS3 The Sims 4, cat toy for Emmett (my cat), giant teddy bear, Minecraft plush cow, Minecraft plush wolf, and Tamagachi Life for 3DS. Her list is pretty do-able. They just bought their own PS3 with Disney Infinity 2 together (after saving and saving and saving)... so the DI characters and games make total sense. That GIANT teddy bear is there because her friends got this for their bday... and while I'm kinda obsessed with the idea of having one... they aren't available until Spring now (I wonder how that would fit in an Easter basket?). There might be a slight Minecraft obsession in our house (which we kind of encourage) so it's not surprising to see those items. But... she has a new PS3 and an iPad mini... she is not getting a 3DS just so she can play Tamagachi Life. There MUST be an iPad app. Head set, toys, American Girls, gingerbread man toys, plush bat, cat toy for Bailey (my cat), Zippy Sack, activity cushion, Kaloo Les Amis, dog, Babar the Elephant Set, spring butterfly, puppets, pink fairy wings, owl mask. Not AS do-able. But... an entertaining list. Ana's list always makes my head spin a little. Mostly because I have to ask her to translate and I think she makes up presents in her head. This year was no different... but after having her go over it with me... we'll do this in 2 parts.... BEFORE she looked at the Cricket catalog and AFTER she looked at the Cricket catalog. BEFORE: The head set is for the PS3 for when they link up with Avery to play minecraft. Right now she talks to them (and it's funny to hear Avery babble babble babble on the TV) and they nod their little dudes head or have to "text". Neither of the girls has EVERY mentioned American Girl dolls. We were happily living in a world clueless about the pricey dolls (and I think I've always wanted one more than them). The plush bat is a Minecraft plush. And the Zippy Sack is "as seen on TV" a bazillion times (and I kinda love the idea). AFTER: I read the rest of the list and did a "what the heck is she talking about and when did we learn French?" I asked her to explain her list so we could "make sure Santa knows what you're talking about" and she grabbed the catalog and started flipping pages for me. ah ha! Gotcha. I haven't EVER seen the "Cricket 2015 Gift Guide" so I guess I gotta flip through the mail pile before Ana sees it from now on. Some of the things she picked are cool. The Babar set if a nice book and Elephant stuffed animal (although I can't remember the last time we saw or read a Babar book or show). The fairy wings are pretty. I want an owl mask too. The French dog is really cute with LONG floppy ears. And... puppets and a little theater could be fun if they actually PLAY with it. And... again..... awwwww because if Emmett is getting something Bailey needs something too. Now I suppose I should actually get shopping... and think about visiting Santa at his house in Madison to show him the lists! 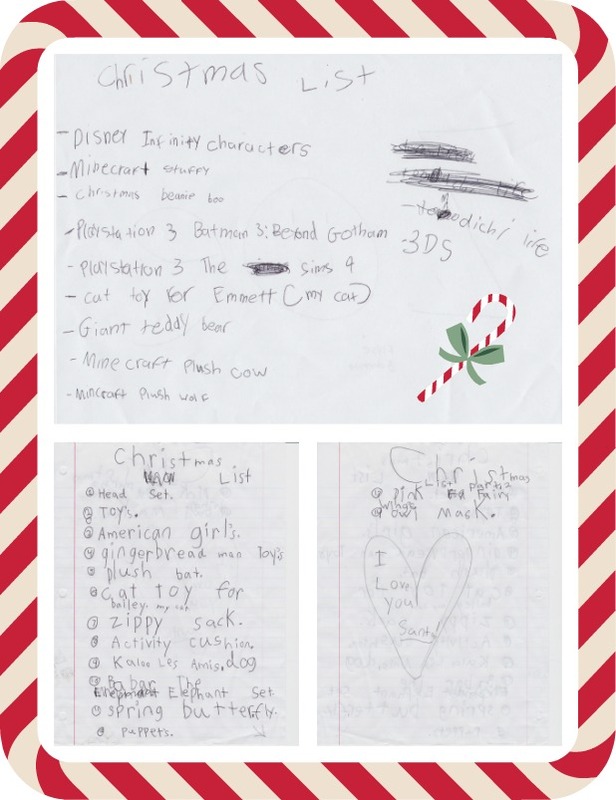 Do your kids make wish lists? Are they logical do-able lists? Or are they over the top and somewhat nonsensical?